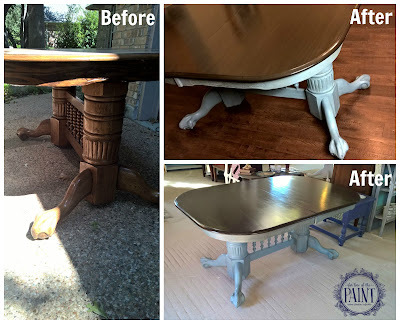 I was so excited by how the Java Gel stain looked that I decided to use it again for this dining table! It came with two 18" leaves, and was absolutely enormous all together! (Well, compared to my work space, for sure!!) I stain with the leaves in if at all possible to make sure that the color is consistent. Then I took an Xacto blade along the edges to separate them before putting on the final coats of sealant. The body was painted in Annie Sloan Duck Egg and Graphite washes, distressed, waxed, and antiqued with dark wax. This may be my favorite neutral, yet beautiful, cool color combination! The table top has General Finishes Java Gel stain followed by a layer of Antique Walnut to add some vintage-inspired variation. I love how the color looks beautiful, but so different, when the same table is set on two different floors (Pergo and concrete). Which look do you love more? Artist Highlight up on RedDoorLane.com!